When I say I'm making a Dutch Baby for brunch, I get a lot of panicked, crazy stares. Come on, guys -- seriously?! It doesn't look like much, but believe me. 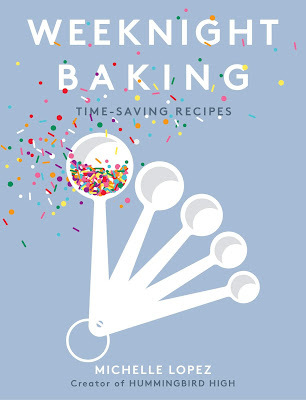 Whip this out at a brunch or cocktail party, and you will have folks oohing and ahhing over your pancakes and drinks. Put your iron skillet on the middle rack of your oven and preheat to 450 (F). 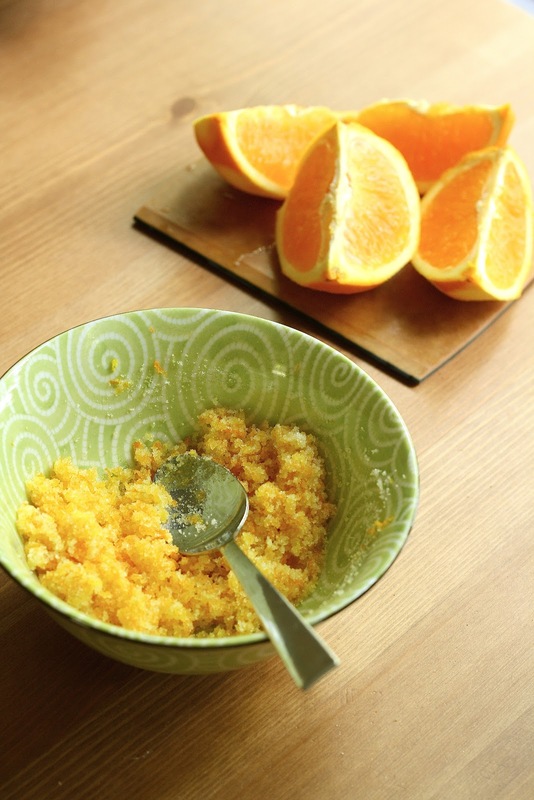 As the oven is preheating, use a cheese grater to remove all the zest from your orange. Combine the orange zest with 1/3 cup sugar, gently mixing the two together with a spoon. 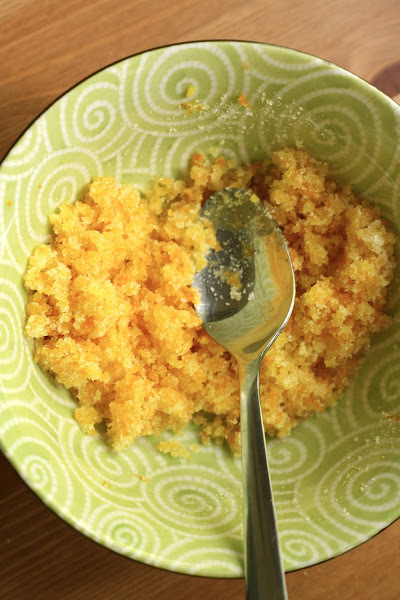 The zest and sugar should begin to form small clump together. 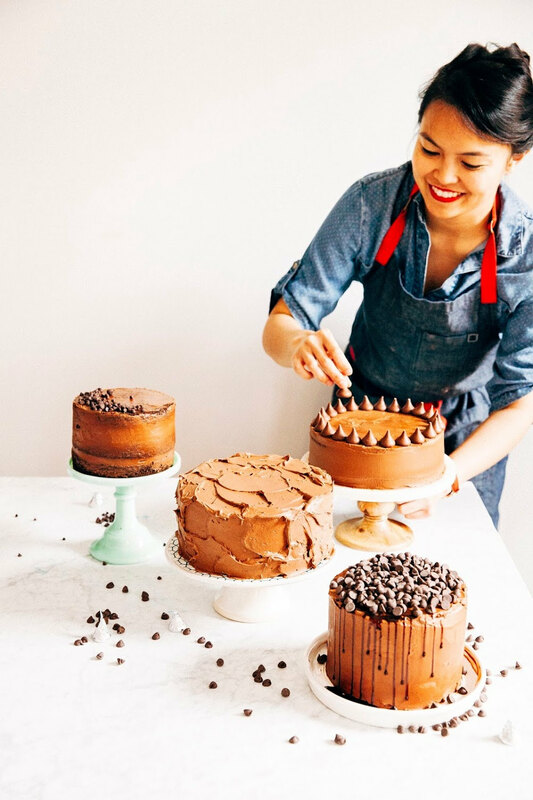 Using a freestanding electric mixer with a whisk attachment (or, use a handheld whisk), beat 3 eggs at high speed until pale and frothy. Then beat in 2/3 cup milk, 2/3 cup flour, 1/4 teaspoon vanilla, 1/8 teaspoon cinnamon, 1/8 teaspoon nutmeg, and 1/8 teaspoon salt and continue to beat until smooth (about 1 minute more). The batter should be thin. Take your preheated skillet out of the oven and add 6 tablespoons butter, swirling the pan to melt the butter and coat the pan. 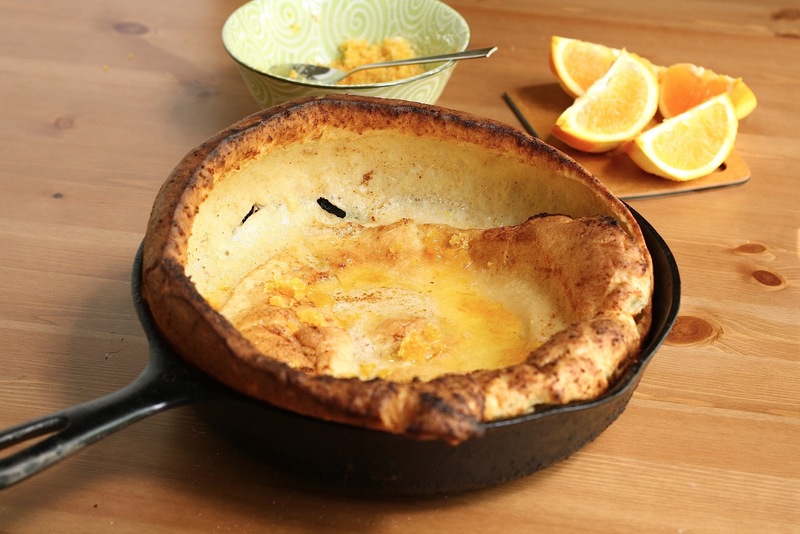 Once the bottom of the pan is covered in butter, pour the Dutch Baby pancake batter into it and immediately return the skillet to the oven. Bake until puffed and golden-brown, for 18-25 minutes. 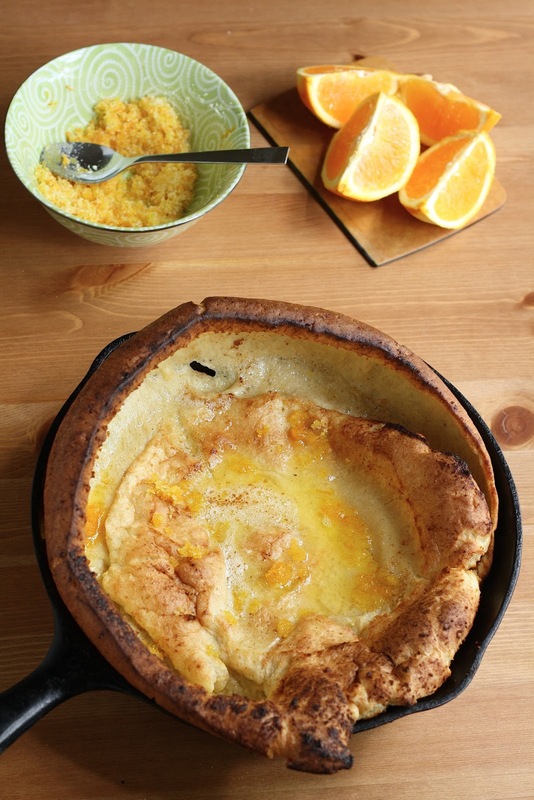 Once the Dutch Baby is done baking in the oven, remove from heat and immediately sprinkle the orange-sugar on top. The heat from the skillet/pancake will cause the sugar to melt. Serve immediately. 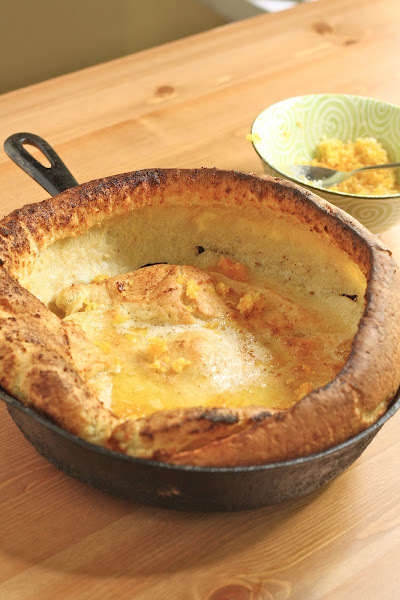 I haven't had a Dutch Baby in years! I had a friend in middle school whose dad would make them for us whenever she had a sleepover. I was jealous they had one of those little cows to put syrup in. Spoke too soon....it's going down! Just made on of these. Delicious! I think next time I might fill it with fruit after the middle falls. Also, you need to try honey butter. Equal parts honey, butter, half and half, and a splash of vanilla. Microwave it for a bit. Good old fashioned German farm food. making one now. thanks for the inspiration! i served with breakfast sausage links! For some reason, my pancake stayed flat and didn't rise up on the sides. Tastes good but wasn't as pretty! Why?